This post explores how organizations could use the Big Data Business Model Maturity Index (BDBMMI) to exploit the Internet of Things (IoT). Antonio Figueiredo (@afigueiredo) recently challenged me on Twitter with an interesting question: How would the Big Data Business Model Maturity Index (BDBMMI) change to support the Internet of Things (IoT)? My hope is that the BDBMMI would not need to change to support IoT. It is my hope that the BDBMMI could be used to guide any industry that is going through a data and analytics-driven transformation, such as what is happening to many industries due to IoT. 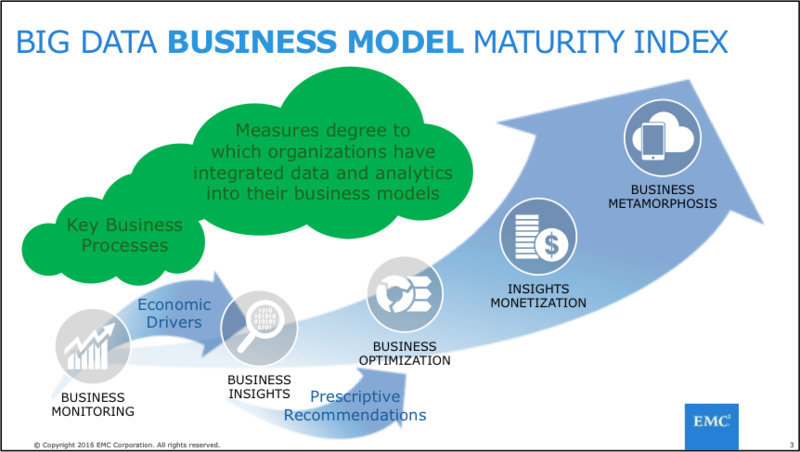 The Big Data Business Model Maturity Index (BDBMMI) is a framework to measure how effective an organization is at leveraging data and analytics to power the business (see Figure 1). We have successfully used the BDBMMI to help organizations not only identify where and how to start their big data journeys, but have used the BDBMMI framework to help guide organizations through the Insights, Optimization and Monetization phases. 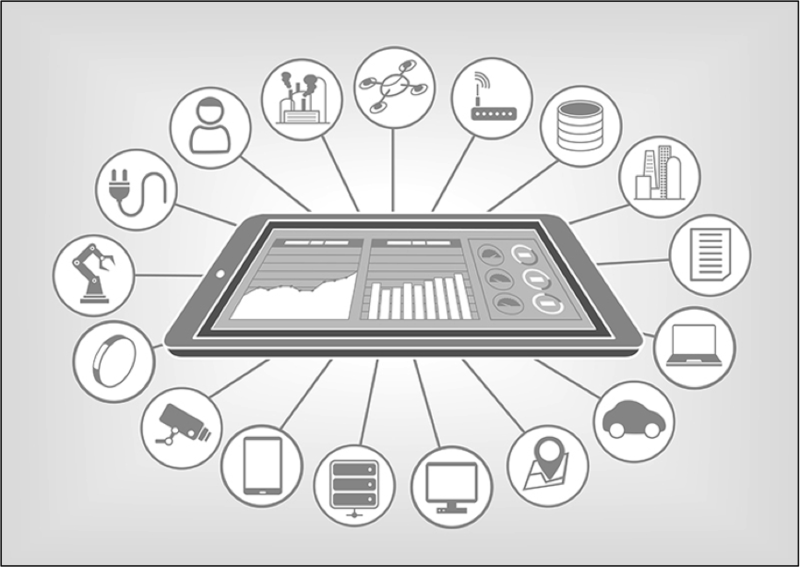 The Internet of Things (IoT) is the network of physical objects—devices, vehicles, buildings and other items—embedded with electronics, software, sensors, and network connectivity that enables these objects to collect and exchange data. As discussed in a previous blog (Internet of Things: “Connected” Does Not Equal “Smart”), one of the ultimate goals of IoT is to create “smart” environments or devices – environments or devices that self-monitor, self-diagnose and eventually self-direct. In that article, I provided an example of what would be required to leverage IoT to create a “smart” city. For this exercise, let’s build upon that article to see how we could use the BDBMMI with IoT to create a “smart” car (and I’d expect that this same process will work for creating other “smart” entities such as jet engines, turbines, lawnmower, cities, airports, schools, hospitals, etc.). The Business Monitoring phase leverages data and analytics to monitor, or report on, the current state of the business. While the Business Monitoring phase of the smart car transformation does not have the traditional Business Intelligence and data warehousing to support operational reporting needs, the smart car analogy does have one important item to monitor the operations and performance of our smart car…a dashboard (see Figure 2)! Figure 2: Car DashboardIn fact, the dashboard is the ultimate Business Monitoring tool and has been embraced as a critical enabling concept by all Business Intelligence vendors. For our smart car, the driver uses the dashboard to monitor the car’s performance and operations. The dashboard displays current state information such as current speed, gas level, engine temperatures, engine revolutions per minute (RPMs), miles until next refueling, total miles the car has traveled, etc. The dashboard also provides feedback to the driver regarding the car operational needs such as servicing requirements, overheating engine and low fuel. As in the Big Data world, the Business Monitoring phase is necessary as it provides the detailed history of transactional and operational data that forms the basis for the next steps in the BDBMMI process. The Business Insights phase applies the 4 Big Data economic value drives (detailed historical data, internal and external unstructured data, right-time analysis, predictive analytics) to uncover potential operational and behavioral insights buried in the data. Providing access the complete history of the car’s transactional and operational data at the individual sensor or node level, as well as the driver’s usage and driving behavioral data. Providing access to semi-structured (sensor logs, error codes, warning messages, vibration readings) and unstructured (customer feedback, mechanic notes, product specs, operating manual) data, as well as access to public data such as weather, traffic, accident reports, road conditions, road maintenance schedules, product defect notifications, consumer report ratings, National Highway Traffic Safety Administration (NHTSA) alerts, etc. There is also the opportunity to integrate additional data about the driver including age, years of driving experience, previous driving record, GPA, years of education, years driving this car, etc. Applying predictive analytics (e.g., data mining, machine learning) to uncover car performance and driver behavioral variations and deviations that might provide car performance and operational opportunities as well driver behavioral opportunities. The Business Optimization phase applies prescriptive analytics to optimize key business processes thru recommendations delivered to customers (drivers), front line employees (mechanics, engineers), and partners. Each of these use cases is comprised of numerous decisions that are being made by the car and the driver around which we would want to build prescriptive analytics (“Tell me what I should do?”) to help optimize that particular smart car use case. These prescriptive analytics would need to deliver recommendations to our key stakeholders (drivers, mechanics, police, emergency medical technicians, traffic control, etc.) in order to guide the stakeholders in the process of making better or optimal decisions. 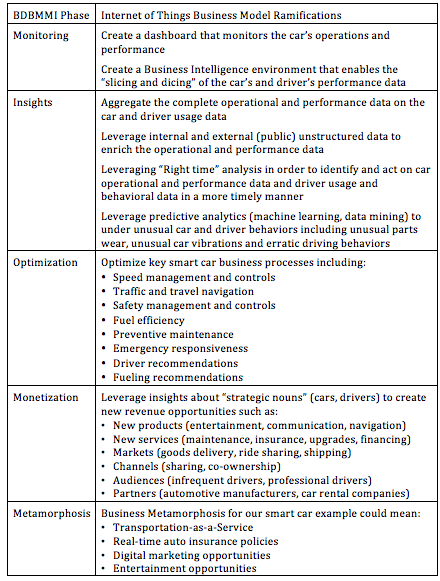 The Insights Monetization phase leverages insights on car’s optimized operations and performance to create new Big Data Business Model Maturity Index opportunities. The fifth phase of the BDBMMI is the Business Metamorphosis phase:The Business Metamorphosis phase enables analytics-enlightened consumption models that embedded the organization’s business models into the business models of their key customers, partners and channels. Transportation-as-a-Service business model where drivers request and reserve cars for specific usage models (e.g., one-time usage, one-way usage, weekly usage). As to complete this effort, I was fortunate to catch Joel Dodd’s (Pivotal, Technical Partner Sales and one most cool dude) connected car demonstration at EMC World. Most excellent! To learn more about Pivotal connected car demo, check out this blog “A Peek Under the Hood of The Connected Car” written by Adam bloom (@adambloom) also of Pivotal. I hope that this exercise has demonstrated how the Big Data Business Model Maturity Index can guide any organization that seeks to leverage new sources of data and analytics can transform their business models. The Internet of Things (IoT) is just one example, and I’d expect that the BDBMMI could be applied as new sources of data are uncovered across a wide range of industries. While the “smart” car market may seem to be the most obvious of plays, any industry that is trying to create “smart” products and capabilities can leverage the BDBMMI to guide their transformation.